Many think that there are four kinds of prayers; adoration, contrition, petition and thanksgiving, but for each person that utters words honest in heart to their God, the number is endless. There had been several albums that offer prayers and promises of late, (e.g. Sapient by Steven Chesne, Valerie Romanoff Healing Music 2) and frankly, there has never been a better time for them to appear. Fires, floods, wars, and unfathomable pain is loose in the world. Our earth is chock full of this dark matter and there sometimes seems to be no end in sight. But I have always been an optimist, full of faith in mankind and a benevolent Supreme Being. Composer Kevin Wood offers up a new album that is full of promise and hope called Eternal. The album has twelve tracks of classically influenced contemporary/New Age/cross genre music with tribal chant, Gregorian chant, vocals of every description, and music that creates meditative soundscapes for body and spirit. I’ve reviewed Wood a number of times and I have always found his compositions emotionally-rich and spiritually satisfying on many levels. “In Search of Meaning,” a tune enigmatic in nature, is the opening number. Jami Seiber’s cello strikes a somber phrase to begin the song, but a lighter heart responds and the rhythmic melody with tribal singing gives it the energy it needs to soar. There is chant in the background giving the song shading and the cello revives once again to harmonize with the singers. “Light Shines Through” is an unusual mixture of sounds. World renowned musician Francois le Roux offers the voice of his cello an adoration prayer accompanied by female vocals, gentle violin, and men’s heartfelt chant. There is Native American elements throughout the album giving it an earthy, honest balance. “Father’s Love” is such a song. Shawnda Rowe Birch sings counterpoint with the shaman, both recognizing the Great Spirit. One of my many favorites on Eternal is “Love’s Embrace.” It is a piano driven tune with many voices, strong bass, and a plaintive message. It is as if two different eras are singing in harmony. The New and the Old speak of a rapturous time when the balance of love and peace will be met. Another strong piano and cello tune is called ‘Time for a Change.” The piano lead is vivid in tone, the vocals reverential, and the message clear as day. The male chorus is solemn, but all the voices rise to the heavens. Using “Pachelbel’s Cannon in D” written a hundred years ago and mixing it with tribal chant, the beautiful tune “Grace Eternal” touches all the deep recesses of the heart. It is not so much a prayer as it is a celebration of spirit. There are many ways to think about, and even more ways to say it, but having an experience where you know God is smiling down on you is uplifting. Again, Wood’s song of the old and the new seems to make sense. The past and the now sometimes add up to the future. “Peace Begins With Me” is quietly sweet and poignantly melodic. Once again we hear the exquisite pairing of cello and piano and it works every time. Each takes a turn, compliments its partner, and deftly moves on; such a balance. “Compassion Reigns” is the echo of an old hymn you have heard somewhere before. It has a mixture of soft cooing voice and reassuring piano, and a resonant chorus in the background. It is a song sung in backwoods churches, some with no walls or roofs at all, but with a strong assembly of faith that acts as the pegs and beams that make it a solid structure. There is a bonus track on Eternal, “Atonement” from Wood’s Kindred album and it fits is perfectly with the album’s theme. It is a blissful song, a modern day mantra of voice and angelic chorus. I don’t know if it is strictly a song of contrition, but the feel is the embracing of love. 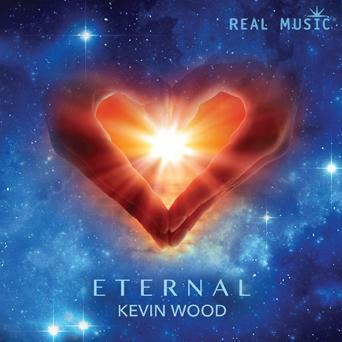 Kevin Wood’s Eternal is a musical companion to a life’s journey of discovery. It starts out with a search, goes through a myriad of transformations, and in the end, finds the answers that have been hidden in our own hearts all along. Anyone who listens cannot be helped but be touched by this music and by our own personal discoveries. Highly recommended.